If you work in a STEM field, chances are you'll be using MATLAB on a daily basis. MATLAB is a popular and powerful computational tool and this book provides everything you need to start manipulating and plotting your data. 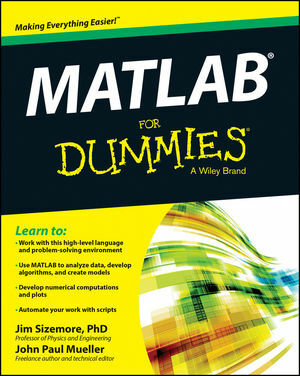 MATLAB has rapidly become the premier data tool, and MATLAB For Dummies is a comprehensive guide to the fundamentals. MATLAB For Dummies guides you through this complex computational language from installation to visualization to automation. Jim Sizemore is Professor of Physics and Engineering at Tyler Junior College. For over 25 years he’s worked in the semiconductor and software industries as a process engineer, device physicist, and software developer and has been teaching college physics, engineering, and math for the last 13 years. John Paul Mueller is a freelance author and a technical editor for both Data Based Advisor and Coast Compute magazines. He has produced 96 books and more than 300 articles to date and has been following MATLAB development for nearly a decade.